It was no secret that the representatives of Goran Dragic were meeting with the Suns on Tuesday evening but no one was really sure what the outcome was going to be. There had been rumours that the Suns were keen to keep the player but there had also been rumours that the Suns had been active in trying to arrange a trade for the player. At this point, no one had heard what the player and his agent were looking for but that seems to be out in the open now. 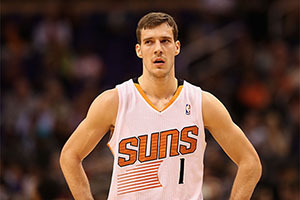 A number of respected sources have stated that Dragic has informed the Suns that he will not be re-signing with the team. It is believed that a lot of this is down to the fact that Dragic is looking for more freedom on the court and control of the team, with the role and presence of Stephen Curry from the Warriors being cited. Dragic has suffered a drop in the level of time he has spent as lead-guard this season and clearly the player would prefer to be the key man for his team. At this point, Dragic has averaged 16.2 points per game, 3.6 rebounds per game, 4.1 assists per game and 33.4 minutes per game this season. After he informed the Suns that Dragic would be looking to move on, Bill Duffy, the player’s agent, issues a list of trade destination that he player would prefer to head to. Yahoo Sports claim to have received these names and they state that the New York Knicks, the Miami Heat and the Los Angeles Lakers are all possible destinations with the Indiana Pacers being listed later as another place where Dragic would be happy to continue his career. It is believed that the Suns have agreed to this request and that they are working on moving the player out before the deadline on Thursday. While there had been rumours that the Suns were possibly going to trade Isaiah Thomas, this wouldn’t be enough to keep Dragic at the club beyond the free agency period in July so you can see why the club are looking at their options now and realising that it is possibly best to move Dragic on. It is not just about Dragic though as there will be other players on the move before the deadline. One player tipped to be moving on to new pastures is Tayshaun Prince, who is waiting to see if he received a buyout from the Boston Celtics. If this comes through and the player is a free agent after the deadline, it is believed that the Los Angeles Clippers and Portland are interested in signing him. It also seems that Portland could be in the mix for Wilson Chandler, the forward from the Denver Nuggets. There had been rumours that Portland were looking at Arron Afflalo but at the moment, it looks as though their desire to snag Chandler is higher. The Blazers have also made it known that Thomas Robinson and Will Barton are available for talks and these players could be heading out if players are heading in.